My current tyres are Goodyear Gen1 winter tyres that were put on in November. Current weather conditions suggest that it was a good idea. My only problem is that the last 250 meters home is quite a steep hill with a sharp right turn at the top. I had to leave my car at the bottom yesterday as it was too slippery even to travel 30 meters. It is a narrow road with turns in it. I eventually managed to reverse up later much to the annoyance of the clutch. I am thinking of applying winter tyre ‘grip spray’ that appears to be successful on some YouTube videos. Would that make much of a difference? 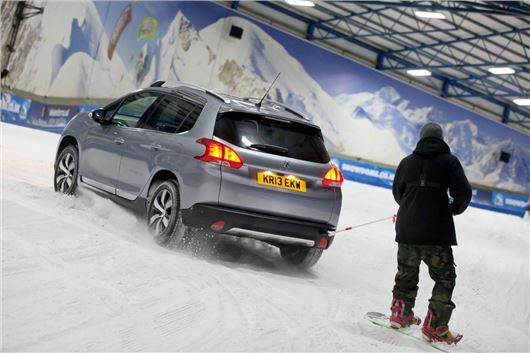 I've driven a Peugeot 2008 with ‘Grip Control’ up a 1 in 3 ice-covered ski run on Goodyear Vector 4 Seasons tyres, so it is possible. Maybe you need to use a higher gear. I’m looking to buy a new SEAT Ibiza FR, 1.0TSI 115 manual. It comes on 17-inch wheels as standard, but there is an option to upgrade to 18-inch wheels for £325. Could you please tell me if it is worth doing that? Definitely not. That’s as stupid as simply burning your £325. All they will do is reduce steering feel, give a harder ride, be more vulnerable to potholes and kerbs, while the tyres will last half as long and cost twice as much to replace. A friend who lost a leg has a newer model mini-van. He has trouble driving because the console prevents him from being able to get the artificial limb placed comfortably. Can you recommend someone in the West Tennessee area who could modify his existing van? I purchased a Range Rover Evoque, new, in March 2013, and throughout my ownership I have had problems during frosty weather. All four doors freeze solid and cannot be opened. The only solution to defreeze is to play a hair-drier around the edge of the door to melt the ice ,which can sometimes prove time-consuming. Brute force cannot be applied for fear of damaging the rubber seals. I've tried applying various substances without success. Perhaps you have heard of other owners with similar problems or know of a cure. I had this with Alfasuds in a particularly cold winter when temperatures plunged to below minus 10C even in the South. The answer was silicone grease smeared over the door-seals. Good in the electric window channels too. My Mercedes AMG sport SLK 250cd will be 3 years old in April 18. I bought it from Motorpoint with 7,000 miles in June and it has now done 19,000. It was serviced by Mercedes at 4,100 in 2016 and by Motorpoint in April 2017 at 7,000 and, being a great believer of you advice, I had an interim service done with oil change by Halfords at 17,000. I intend to continue to get it serviced every 10,000 miles (rather than the suggested 15,500) and expect the next one to coincide with the MoT in April 2018 when it will have done around 27,000 miles. What additional servicing is required at this age and mileage. Does its need the 7-speed automatic transmission oil changed or the differential oil? I was hoping to avoid having to take it to Mercedes. The transmission fluid should be good for at lest 6 years in this model. No need to change the rear axle fluid. However, wise to get the brake fluid checked for contamination (mostly by condensation) and replaced if too contaminated, then checked again every year. Good to replace the engine air filter and the cabin pollen filter as well. And, to service the roof opening and closing mechanism and its seals. I want to buy a car, and am considering the positives and negatives of the Honda CR-V 1.6iDTEC 9-speed automatic; the Skoda Kodiaq 1.4TSI 150 DSG, the VW Tiguan 1.4TSI 150 DSG and the Toyota RAV-4 2.5 hybrid CVT. I drive approximately 10,000 kilometres a year. Which do you suggest will be best for my needs? The RAV-4 hybrid 4WD. Likely to be by far the most reliable with no diesel DPF problems and no DQ200 DSG transmission problems. It also carries the longest warranty: 5 years. My wife wants to get rid of her old Ford Focus and is considering leasing an SUV or similar. The main stipulation is that it fits two child car seats (Britax Romer Dualfix) in the back. The catch is that she's six feet three tall, so leg room in the front is also essential. Any thoughts? She's considering the Audi Q2 if that helps. The Q2 might work, but you'll probably be better off in an MPV that provides a greater depth of cabin for your legs while also making it easier to get the kids in and out. VW Golf SV (as long as it isn’t automatic), or a BMW 2-Series Active Tourer (of which the 225xe is a plug-in hybrid with four wheel drive, so ticks a lot of boxes). You advised the owner of a 3-year old VW Tiguan diesel with 27,000 miles to balance short runs with long runs of 100 miles or more to avoid problems with diesel particulate regeneration. I have a 2 year old Volvo XC60 diesel with 20,000 miles and was advised by my Volvo dealer recently to drive at a constant speed of around 50 mph for around 20 minutes once a week to get good regeneration. This equates to a 25 mile run on the motorway. Does regeneration differ with different car makes, or should the Volvo dealer have told me at the time of purchase that the car would need some long runs of 100 miles? 2,000rpm is more important than the road speed, so that will mean selevting a lower gear. The process differs car by car and by how the car is regularly used. Passive regeneration works best when the DPF is as close as possible to the heat of the combustion chambers, preferably bolted straight onto an engine with an integrated exhaust manifold. It passively regenerates least effectively when situated several feet away from the engine under the car. Then it will need to actively regenerate more frequently. Best to open the car door before you switch off the engine and if you feel and smell considerable heat, that is the DPF actively regenerating using fuel from the engine. DO NOT SWITCH OFF. Best to take the car for a further 5-10 mile run to allow active regeneration to complete, otherwise you will end up with contaminated engine oil from the extra diesel injected for regeneration sinking instead into the engine sump. Which small automatic SUV/Crossover model, spec and tyres would you recommend with comfort and economy as priorities. The maximum sizes are 1,850mm wide and 4,600mm long so it would fit in our garage. This morning I noticed that the rear screen on my wife’s Mercedes A-Class was crazed and some bits completely out on the ground and rear bumper. It was not like that the previous afternoon and the car was not moved in the meantime. It was parked on the drive at the rear of the house and there is little likelihood that any kids have been in to vandalise it. Nor are we overlooked by air gun toting people. There was no sign of a projectile and we are not under any normal flight paths. I’m bewildered. Any ideas? There will have been a stress crack developing, usually from closing the hatch from one side rather than by the pull handle or the centre. Water will have got into the crack, then frozen in recent sub zero temperatures and that's what shattered the window. I am e-mailing for advice after the two successful purchases I have made on the basis of it in the past. I require a fairly low priced car that will be a hybrid automatic that my wife can also drive. She is just 4ft 11in tall and needs to see over the steering wheel. I see that you do not consider the Honda CR-V 2.2 iDTEC to be as reliable as the CR-V 2.0i petrol VTEC. I have a 5-year old, regularly serviced CR-V 2.2 iDTEC, which has done just over 50,000 miles, mainly towing a caravan long-haul to such destinations as the South of France. Am I likely to encounter problems if I keep it, or should I decide to replace it before it develops problems? I am a retired lady driver in the process of replacing my 7-year old petrol 1.6 Qashqai. The vehicle I am being offered, which takes all my available budget, is a petrol 1.2 Turbo Acenta. I am assured it has more power, better consumption and is cleaner all round than the 1.6. The car has to transport 2 adults with dogs and baggage on fairly hilly roads. Can a 1.2 Turbo really cope? I drive a 2012 Mercedes C180 that I am quite happy with, as it has proven to be reliable with sufficient performance for my purposes. I recently looked at a Jaguar XF as a possible replacement, but, after found only two petrol models with the rest all diesel. Being retired, I only do around 6,000-7,000 miles a year and it has always been my understanding that to prevent particulate filter problems a car needs to be driven some 15,000 miles a year. I read recently that sales of new diesel cars have dropped by around 30% and wondered if the used market is a reflection of this? I have no specific knowledge of the XF and would appreciate your comments on this model as a replacement for my Mercedes, assuming I am able to find a petrol model. Yes, demonisation of diesels has finally woken up the public and sales of new diesels have dropped by 30%. The emissions kit they have to carry causes too many problems. So yes, stick to a used V6 or V8 petrol-engined XF, if you can find one. The problem is when 3 – 6 year old XFs were new, very few petrol-engined versions were sold because everyone then wanted diesel. For problem areas, see: /carbycar/jaguar/xf-2008/?section=good / Alternatively, seek out an XE with either the 2.0 Ford Ecoboost engine or the 2.0 Ingenium SI4 petrol engine. Again, with diesels - a manufacturer is recommending an owner doing 25 miles a WEEK or 100+ a month just to guarantee it passively regenerates the DPF. So all that extra mpg they're getting over petrol engined cars is essentially wasted just to burn off some soot. Just shows how ridiculous it is buying a diesel if you either don't do mostly motorway type driving (even on lower mileage, but then you get far less of a benefit from the better mpg than petrol if you do very low mileage) or over 20k miles (preferably 25k) pa and a regular (at least once a week if not more) amount on faster-moving roads. Obviously if you tow a caravan regularly, then that's a different matter and you have to adjust accordingly, but if you only use it a couple of times a year, then surely it would be better to buy a much smaller, cheaper car suited to day-to-day needs and pay for an appropriate diesel hire car when you need to tow. Thoughts? For sticking door seals you could try Gummiflege, i have used for a few years and seems to do the job of stopping them freezing to the door. agreed, I use this on my door seals every month of so, stops sticking in winter and squeeks any other time. Again, with diesels - a manufacturer is recommending an owner doing 25 miles a WEEK or 100+ a month just to guarantee it passively regenerates the DPF. So all that extra mpg they're getting over petrol engined cars is essentially wasted just to burn off some soot. Just shows how ridiculous it is buying a diesel if you either don't do mostly motorway type driving (even on lower mileage, but then you get far less of a benefit from the better mpg than petrol if you do very low mileage) or over 20k miles (preferably 25k) pa and a regular (at least once a week if not more) amount on faster-moving roads. Obviously if you tow a caravan regularly, then that's a different matter and you have to adjust accordingly, but if you only use it a couple of times a year, then surely it would be better to buy a much smaller, cheaper car suited to day-to-day needs and pay for an appropriate diesel hire car when you need to tow. Thoughts? The fitting of Particulate Filters is becoming more & more likely on Petrol engines, in fact some manufacturers such as VW are fitting them already, so in years to come you will face exactly the same problem for short journeys, whether you choose petrol or diesel. I suspect once more people have changed over to Petrol cars, fitting a petrol particulate filter to all new cars will rapidly become mandatory. because petrol cars emit health damaging particulates too, as well as several other nasty substances and when there are more on the road the pollution levels will eventually rise to where they are today - rinse and repeat. Within the next ten years, I suspect there will be so much anti-pollution equipment bolted onto cars, that the only reliable options available for short journeys, will be an Electric Car, Bike, or Horse and Cart. That might be going a bit too far, though it might still happen (to a degree) if people let the green lobby and leftwingers who really run councils and government get their way - unfortunately being an armchair critic (I am just as culpable as most) won't advance the cause of the motorist. I would say though, that whilst all forms of fossil fuels are obviously pollutants and, to varying degrees harmful to human health, diesel still seems to be worse of the two, as its been noticeable that since diesel cars became vastly more popular and prevelent in the UK, and especially in cities, respiratory diseases and complaints have increases a great deal. As an asthma sufferer myself, I can vouch for that - I went to college in London in the early 1990s, before the rise in diesels, and worked in the same area (of London) much more recently, and I noticed my asthma was far worse in recent years than when I was at college, and yet I was out and about at least as much, if not more so at that earlier time, including when vehicles were far more polluting generally on a like-for-like basis than today . As I've said in another post (part 1 of the letters), having public (consumer) pressure brought to bear on the car and van manufacturers would easily get them (as they do for HGVs) to introduce DPF (or similar) warning/control/information systems so that they can be used more wisely, including the adpation of driving styles to suit passive regens, as well as to force manufacturers to start offering cars specifically designed for city use that either had automatic DPF systems that wouldn't be harmed by short use, new tech so they weren't required at all or at least a combination of the info/warning systems I previously mentioned and higher use of hybrid systems that would reduce the need for the fossil-fuelled engines for very short or exclusively low speed urban journeys. It's not just air pollution we have to suffer because of the eco-loons forced people into nasty dirty diesel cars in order to reduce the production of harmless plant food. It's the noise too, I bought my London home on a main road in the late 90s when diesels were rare - I'd hear the odd bus but traffic noise wasn't a problem from within the property - within three or four years I had to change the windows to try to reduce the din of diesel clatter from the inevitable London traffic jams, a further 5 years down the line where practically every car on the road was a diesel and New Labour's 7m+ extra people are jamming the roads even more, the expensive sound-proofed windows were no longer up to the job of containing the din. Needless to say - I moved! Diesel cars should be banned - it's that simple. I humbly suggest to AS of Warrington to find one of the very good MB indies in his area to perform the interim oil changes instead of Halfords. Nothing at all against Halfords but when the time comes to sell the car on, a name known in MB circles on the service record will be a more welcome sight for many potential (quite fussy about such things) buyers than the other, plus genuine filters will more likely to be used instead of some generic make. Agree wholeheartedly with more frequent servicing whoever does it.